Grab a table with pool views while you map out your day over breakfast (or lunch, if it was a late night). It's the kind of pool that gives you options - and what's not to like about options? Compare notes with fellow guests on favorite sights and casinos. Push the curtains off to the side so you get the full effect. Right those wrongs from the previous day with a great workout right onsite. You're an 11 minute walk from all the action on the strip. Kil@wat offers poolside dining and drinks. Visit WELL Spa for a Swedish Massage, facial or manicure. The Bellagio Fountain show is worth the 15 minute walk. The High Roller ferris wheel, one of the world's highest, is a 15 minute walk from the resort. 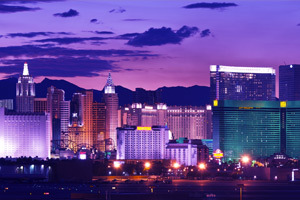 Planet Hollywood & Casino is a 4 minute drive from the resort. Try your luck at a hand of poker. Wynn Las Vegas Casino is a 10 minute drive from the resort. Are you feeling lucky? Private balconies are perfect for a personal happy hour. If you’re looking for a little peace and quiet without straying too far from the action, the Platinum Hotel makes the perfect getaway. A pet-friendly, non-gaming resort just one block off the Strip, it goes all-out on amenities, including full-service concierge, complimentary valet and a spa that’s open seven days a week. (Let the pampering begin.) Between massage and body treatments, make time for poolside lounging, then head back outside later and find seats by the glowing fire pits. Plan for some quality time at the fitness center to offset the occasional dinner splurge or mind-blowing breakfast buffet (worth it!). Even if you were fully planning to make lunch in your suite, you may be tempted to take the easy way out and leave it to the pros at the arty onsite Kil@wat restaurant. Choose from three impressive suite types – the Solitaire, Princess or jaw-dropping Strip View Marquise Suite, with two master king bedrooms, baths with whirlpool tubs and a wraparound balcony overlooking the Strip. With layouts ranging from 900 to 2,200 square feet, each residence has a walk-out balcony, pillowtop mattresses and a full kitchen with granite countertops and stainless steel appliances. Even the smallest suite is three times larger than the typical Vegas hotel room, excellent news for anyone traveling with a lot of kid gear (or several amazing pairs of shoes). Dazzle your crew with your finely-tuned advance-planning skills and have groceries delivered upon arrival. There’s also an onsite sundries shop that’s pretty good at anticipating what you may have forgotten to pack, so don’t fret too much if you think of something halfway through your flight. Park yourself by the pool and perfect your tan or make some headway on your paperback while keeping an eye on the kids in the pool – that inflatable flamingo makes them easy to spot. Get the lay of the land on the Big Bus Hop-On Hop-Off Tour before narrowing your list of must-sees. Head for Hoover Dam or the Grand Canyon, or stick closer to home and take advantage of the insane Miracle Mile shopping scene or do a quick tour of the mainstays. Keep the kids entertained with visits to the Mirage volcano, Venetian gondolas, Bellagio fountains, MGM lions, Mandalay Bay shark reef, Planet Hollywood and the list goes on and on. Brought your clubs? Championship golf courses abound – take your pick or try a few. Thrill-seekers among you? Head for the record-breaking roller coasters right on the Strip, or try SkyJump, a controlled free fall off the Stratosphere Hotel (108 floors), or the X-Scream, a teeter-totter suspended a dizzying 866 feet above the sidewalk. Have someone keep a camera handy – you’ll definitely want photo-proof.